If you fancy an adventure, a reason to get fit, and an opportunity to help animals, then Vegan Cycle India is for you! Veganuary is looking for another few participants to take part in our charity bike ride during February 2019 in Rajasthan. Cover your own costs for hotels/bikes etc (roughly £850 / $1,200) and book your own return flights to Delhi (roughly £500). A £250 deposit is required to secure your place (this will be taken from the £850 costs). The best way to explore India is on a bike! We will be using Kalypso Adventures who will take care of us from the moment we land in India, and until we’re dropped back off at the airport to go home. Most people are capable of cycling 80-100km per day. This event is not for the super fit endurance athletes who wish to test themselves, but an event for anyone with a reasonable level of fitness. We do recommend you train and get yourselves prepared, but it’s not a race and everyone will be cycling together and supporting each other. How will I raise the money? Veganuary will provide a fundraising guide to help you easily achieve the £1,000 minimum fundraising target. All funds raised will go to support our charity Veganuary: to help inspire thousands more people to go vegan and reduce the suffering of farmed animals. Some people may choose not to fundraise and can self-fund the £1,000 contribution to Veganuary. 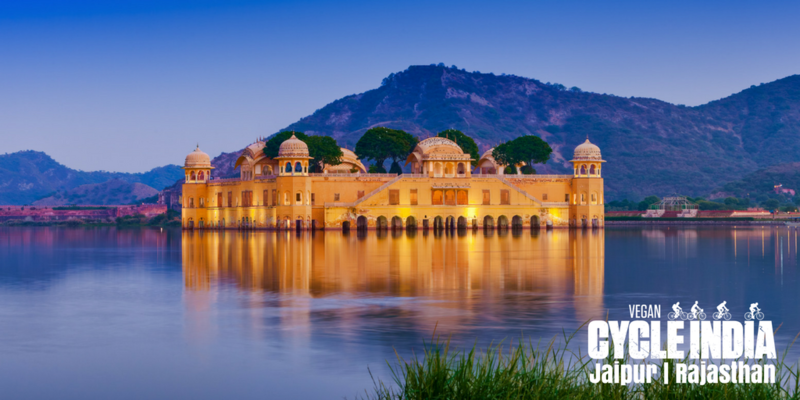 You’ll need to book your own return flight to Delhi (arriving February 9 in the morning and flying home on February 17, 2019) which from the UK is around £500. From other parts of the world, flight costs may be higher or lower. You’ll also need to pay for the costs of the hotels, transfers, bikes, food & drinks etc which will be £850. This fee will be paid directly to Veganuary who will transfer this to the tour company in advance. During the event you’ll not need much pocket money, although alcoholic drinks are an extra. You will need to supply your own cycling helmet, and 5 pairs of cycling shorts. Some people also bring gel seats. We will provide a full kit list nearer the time. Do I need to be from the UK to take part? No! We’re hoping to pull together an international group of cyclists, so the more countries taking part the better! We’ll be asking everyone to book their own flights so we’ll need to coordinate arriving at Delhi airport. Some people may like to stay on in India, or travel on to other countries, and this can also be accommodated. Do I need to be vegan? No. Whilst we anticipate that most of the group will be vegan/vegetarian, we’d love it for anyone interested in veganism and reducing animal suffering to take part. Will all the food be vegan? India is a country which is friendly to vegetarians. Veganuary will be working hard with the tour company to ensure all food served is vegan. In many of the hotels a buffet service is the norm, so there may be animal products served for other guests at breakfast and dinner. But we will ensure there is a good selection of vegan options available for the Cycle India team. While cycling there will be regular pit stops where fruit and vegan snacks will be provided. All lunch breaks will be catered by Kalypso Adventures and will be free from animal products. The accommodation will be good. Our tour company selects the best available hotels on the route to make sure we’re well cared for after a day on the bike. We have links to the hotels on our [itinerary page]. Most of the group will be sharing twin rooms, although if anyone prefers a single room then there will be the option to pay a single supplement of £300. You’ll need to organise a visa. This can be done electronically a few weeks before we travel (we can help you with this). You’ll also need to seek the advice of your doctor to make sure you’ve had all the required jabs. Please make sure you have appropriate travel insurance which covers you for a cycling adventure in India. The good news is Rajasthan is pretty flat. There will be a few climbs, but not as tough as other areas of India. Some of the roads will be a bit rough in places (sandy tracks, potholes etc), but Kalypso provide modern Cannondale mountain bikes to handle these conditions. It will still be a challenge for many and we highly recommend training in advance. We will be supplying gradient info in due course. The peak daytime temperatures will be around 25-30°C or 77-86°F so a nice temperature for cycling. It can be cool in the morning/evenings. Whilst nothing can be guaranteed, rain is unlikely in February in Rajasthan. If you and any friends and family are interested in taking part then the first stage is to register your interest by contacting us. Places are secured on a first come, first served basis by paying a £250 non-refundable deposit. We’re restricted to a maximum of 40 places by the hotels we’re visiting, and only have a few spaces left, so hurry! We look forward to hearing from you. This is going to be fun!